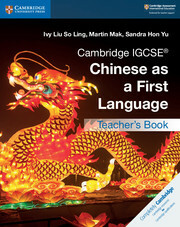 Save time planning and take an active approach to teaching first language Mandarin Chinese. This teacher’s book provides you with practical and effective teaching and differentiation suggestions, as well as ideas for classroom activities. It also contains suggested answers for activities in the coursebook and workbook as well as mark schemes for exam-style questions to save you time when marking. This teacher’s book helps you make the most out of the suite, offering ideas for lesson planning and classroom activities. A variety of coursebook activities helps you with mixed-ability classes. Helpful recommendations for other resources such as photos, movies, posters and online videos make for exciting teaching and learning. Clear syllabus mapping allows you to structure your lessons easily.